Place the gula Melaka and water in a non-stick pan and simmer, stirring, till all the sugar dissolves. Pour it through a sieve into another non-stick pot and simmer for 10 minutes, until the mixture starts to thicken. Then add the cream, salt and butter. Remove from heat and set aside to cool and thicken. Place water, butter and salt in a pot and heat until butter melts and the mixture starts to boil gently. Quickly pour in all the flour and stir with a wooden ladle until the dough mixture starts to pull away from the sides of the pot, and forms into a ball. Remove the pot from the heat and set aside to allow the dough to cool for 30 minutes. Remove the dough to a mixing bowl. Using an electric beater, beat for 2 minutes. Add eggs, one at a time, beating slowly and then beat in the vanilla. Make sure the mixture is well incorporated. The dough should be soft and shiny. Grease a baking tray and pre-heat the oven to 220°C. Fill the dough into a piping bag fitted with a star nozzle and pipe into éclair shapes, about 15cm long. Remove from oven and allow to cool in the fridge. Place the custard mixture into a bowl and add the durian pulp, stirring to mix. Whip the cream till stiff, then fold into the durian mixture. Place in the fridge until ready to use. Fill the durian cream into a piping bag fitted with a nozzle. 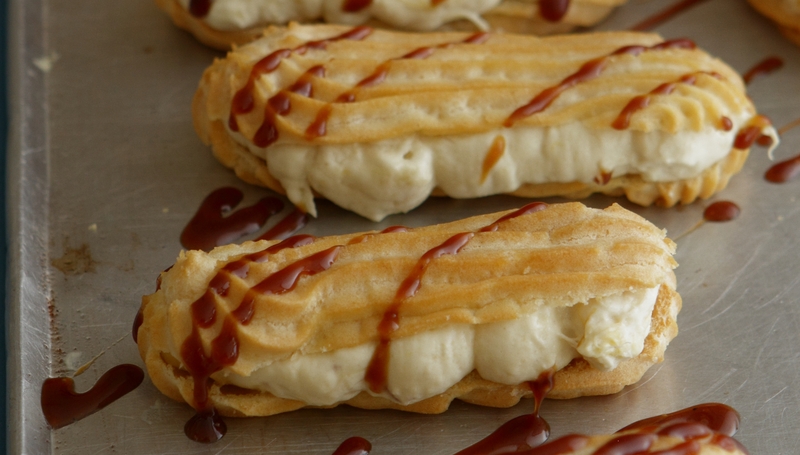 Pierce each eclair about 4 times down its length, squeezing a little of the cream into it each time. Drizzle with the caramel, and serve chilled. Note: Use good quality durian, such as the Musang King. The filling recipe doesn’t call for sugar, but if you would like it to be sweeter, you can always add some.